Autoresponders allow your users to send automated messages to applicants when they apply and are processed by your users. There is an automatic confirmation sent to the applicant when they apply, then a follow up message is activated when the user processes the application. These follow up messages are triggered by the three traffic light actions they can take from within the ATS of the vacancy, and the message reflects the action taken. When autoresponders are activated on your idibu account, they will automatically be populated with a default message for each action. However, we'd recommend reviewing these and editing them in line with your own communication and candidate engagement policy. The autoresponder messages live within the Candidate Engagement Suite on your idibu account, as this is where all of your automated messaging is managed*. *NB: The options available here will depend on your idibu package. 2. 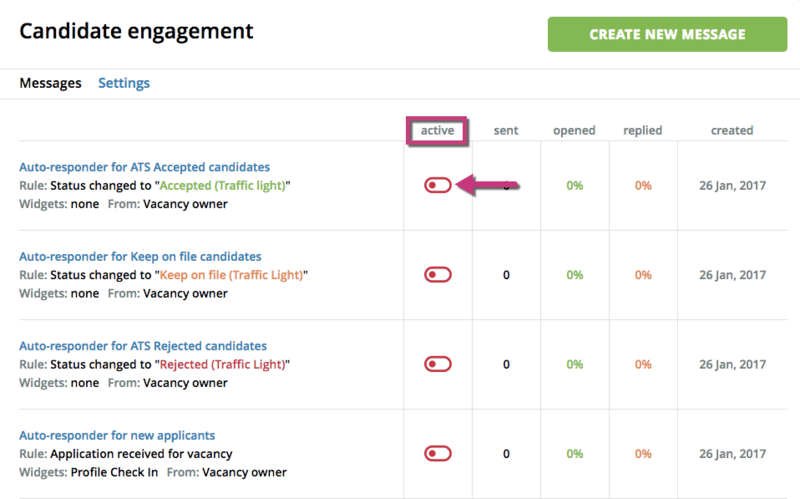 Click on 'Candidate engagement' from the drop down list that appears. ...then speak to your idibu account manager to activate the autoresponder tool within the candidate engagement area. Why? When we first launched our new platform Auto-responders were activated via a plugin all on their own. 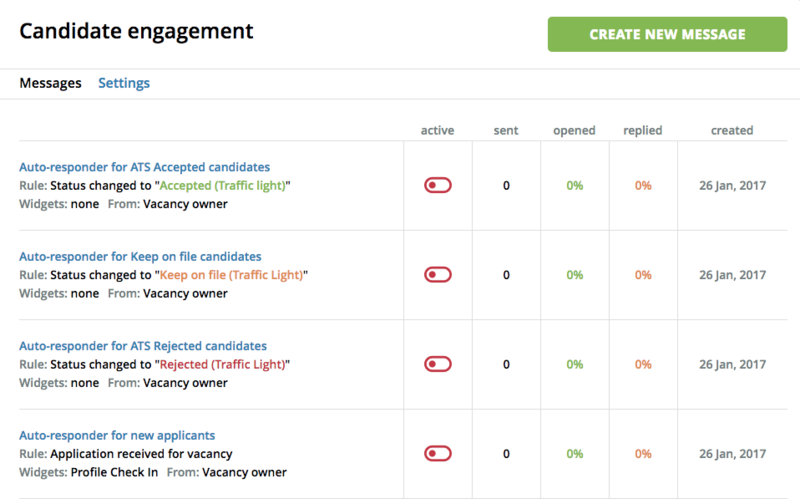 However, when we designed the Candidate Engagement suite we concluded that it would be a much better experience for you be able to manage all automated communication through this area. 3. 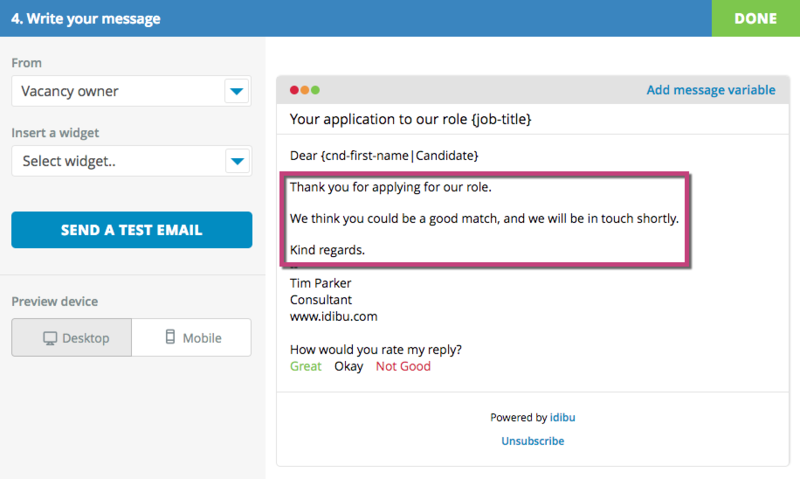 When you have entered the Candidate Engagement area you will see the Autoresponder message options listed at the top of this page. 4. In the 'active' column, you can toggle the switch to activate and de-activate each autoresponder message. If the switch is red then the responder is deactivated. If it is green, it is active. 5. To access the Autoresponder details, click the title of the Autoresponder that's in blue text. 6. The page will automatically open at step 1 of the message set up - However, steps 1 to 3 will already be populated with all the right details, so just click 'edit' on the right hand side of step 4: "Write your message"
7. You will see that this has already been pre-populated with a basic default message (or of course, any message you have already edited and created here). 8. The system defaults to provide details of the user who is the vacancy owner, but should you wish to you could change this to another individual by clicking the drop down. Keep in mind though, that this will be the default for all responses sent to every application. 10. The signatory details will be as per your selection in the 'From' drop down - either the vacancy owner or the individual you selected for all. The information will be taken from the details populated in their user account. 11. If you are subscribed to the full candidate engagement suite, then data collected from the rating replies will populate in the Engagement Reporting dashboard. On a final note, remember you can monitor the success of your candidate engagement through your Autoresponders with the stats collated against your messages. If you are concerned about the performance of a message then you can either edit it, or for more comparative analysis, deactivate it and create a brand new one from scratch. That means you can compare the success of the new message against the old.